The Pirates of the Green Bogie is a unique Pirate Party Show for Children featuring slapstick, storytelling, horrid pirates, and the world’s smelliest sock! 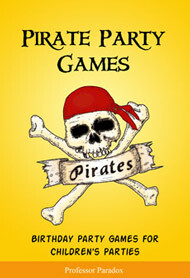 This is pirate party entertainment that fires the imagination of young pirates and scallywags. Children just love pirates: they are naughty, rude, disobedient, love anything disgusting, and they aren’t too fond of washing either. And Professor Paradox has a wonderful pirate show for children that captures their imagination and keeps them laughing for an hour. This is a show guaranteed to fire the imagination of young pirates and princesses as they hear the story of Captain Dribblesnot and the Pirates of the Green Bogie. Now these pirates have been shipwrecked not too far away and are heading towards us at this very moment. They are mean, they are smelly, and they are very hungry. If we are going to stop them then we need he help of some brave and enthusiastic children, along with some groan-ups with a sense of humour …. This show is carefully devised so that it is exciting, funny, and a little bit disgusting, so that it appeals to children of a certain age. 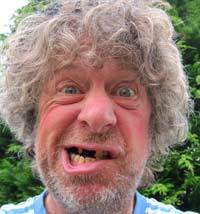 It is carefully adapted to each individual audience so that it isn’t too scary if there are young children in the audience, whilst older children will hear horrible tales of the foulest most disgusting pirates who never washed their feet nor cleaned their teeth! So every show is different, and each age group gets a slightly different show. There is more to pirate party entertainment than dressing up as a pirate and shouting ‘ooohh aaaarrrrh me hearties’. Its all about stimulating children’s imagination as they are taken on an adventure with tales of pirates, princesses, mermaids, buried treasure, parrots, and heaps of silly slapstick and fun. 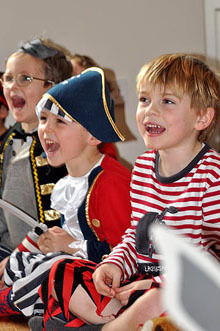 The children get to take part, demonstrating their skills as seasick sailors, pirates, princesses, and heroes in an adventure that lasts about an hour and keeps the attention of the audience the whole way through. This is an extremely silly pirate adventure to lift the curse of the Green Bogie and send the pirates back to their ship. Swords are dangerous and blood is messy, so Professor Paradox uses his legendary magic skills to create a show full of laughter, fun, slapstick, and sillyness. Featuring Flying Walking Stick, the Enchanted Rainbow, and the Worlds Smelliest Sock, this is a show that delights adults and children of all ages. Loads of laughter, great dollops of sillyness, buckets full of bogies (maybe not that one) and heaps of audience participation so that the children are the stars of the show.